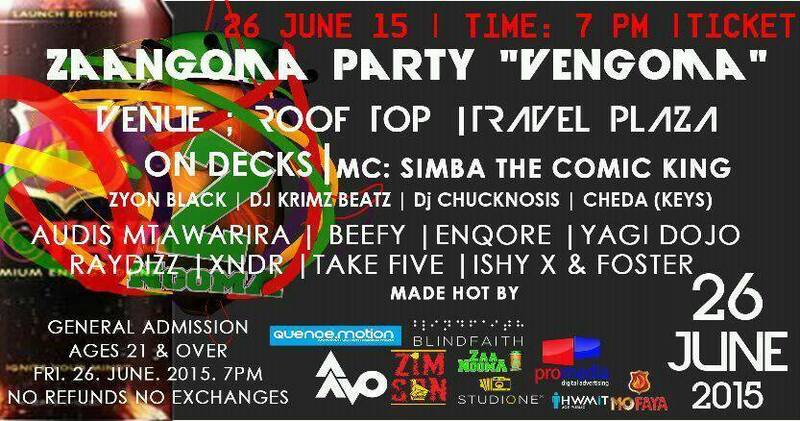 The guys behind the Zaangoma show (if you have been living under a rock, check here, here and here) decided to shed more light on that #26June hashtag. 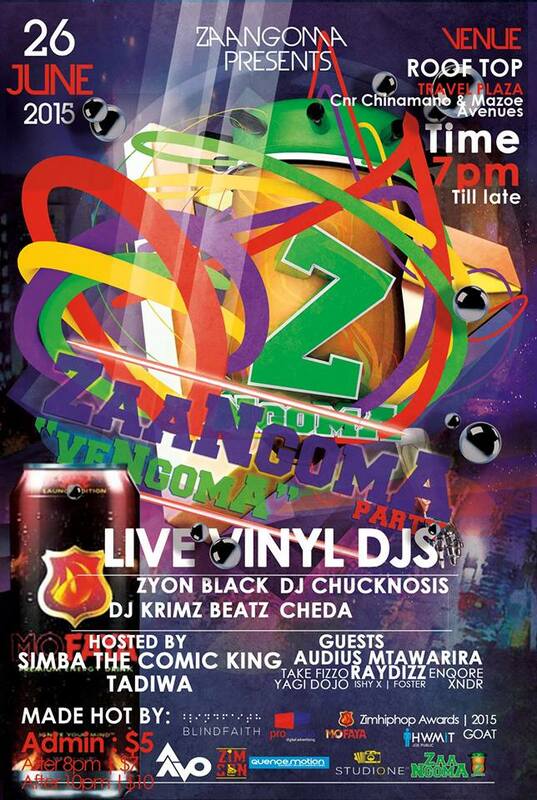 It is actually the date to their new series of Zaangoma parties. This is a welcome development to the urban music shows being held in and around Harare. 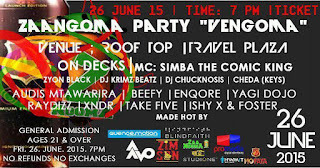 The first of these parties is being held at the now-popular Roof Top at Travel Plaza, located in the Avenues area at Cnr Mazoe St. and J. Chinamano Ave. Hosted by the award-winning comic Simba the Comedy King and Zaangoma presenter Tadiwa. This party is meant to celebrate urban music (i.e. Zim Hip-Hop, EDM, Zim RnB ,Progressive house and African electro as well as ZimPop(although hip hop will be the dominant genre on the day).This is scheduled to be the first of the monthly parties. 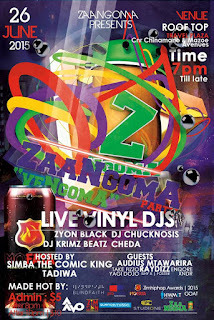 You can expect guest appearances from internationally acclaimed Zimbabwean singer,songwriter and producer Audius Mtawarira (featured on Zaangoma Episode 3), prolific visual artist and animator Nqobizitha “Enqore” Mlilo as well as well-known Disk Jockey, Producer and Christian Hip-Hop artist Take Five (or Take Fizzo). To be part of this party advance tickets are being sold at $5 each. The tickets are available at Avo Apparel (Booth 78 Kwame Mall (Opp Homegate)) and Insignia Book store, Joina City. If you do not manage to get the tickets though, entry is $7 after 8PM and $10 after 10PM. You may by now have noticed the vast amount of logos on the poster and the ticket (yeah, that's a whole lot of co-signs). A quick run-through will reveal Avo Apparel, Zim Son Clothing, Blind Faith, HWMiT (yeah the one you kno), MoFaya Energy Drink (apparently owned by SA DJ Sbu) and Quence.Motion. So come and let us celebrate life and music and witness the genesis of a brand of shows that have only been experienced at HIFA level. If you're looking for a new outdoor experience this could just be IT!